I recently attended an educational session that forced me to think about how I could apply the lessons learned to KSB. The body of the presentation suggested that consumers (I know some of you hate it when we call patients consumers, however as health plans change they certainly are buyers of services) make decisions when we understand their pain points. 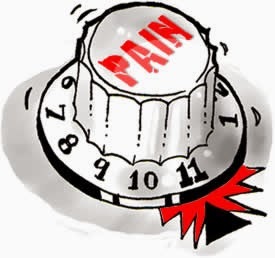 As providers our job is to diagnose their pain and provide solutions. I ask you to think of diagnosis in a different way than a medical diagnosis. We may be creating a pain point with delayed waits, dirty rooms, bad food, poor billing practices, etc., etc., etc.,. The answer might be different for any patient. The speaker suggested that we develop the best three questions to identify our patient’s pain. If we were to write a book as to why someone would choose KSB, what would the tile of the three chapters be? There should be only three, more leaves a confused message. What are the three things KSB does best and differently from our competitors. What are the top three claims that cause our customers pain? What are the top three things that KSB does best? 1)Third party billing staff are rude and uninformed. 3)Keep abreast with the current trends in healthcare and initiate as many as possible. 1. Same as Kathy's No. 1. 2. The bills are not clear what the charges are for and very difficult to understand. It must be awfully confusing for the elderly patients especially. 3. The difficulty with Esoar! 1. Advertising is great making people aware of new doctors, our capabilities and awards. 3. KSB does a good job donating and getting our name out in the community as well.